The Saskatchewan Building and Accessibility Standards Appeal Board has ordered the property developers to back-fill the Capital Pointe hole in downtown Regina. The 14-page document, released Tuesday, outlines the reasons for the board’s decision following a court-ordered rehearing of portions of the original appeal filed by the City of Regina. The rehearing in January was not attended by representatives of Westgate Properties, the property management company for Capital Pointe. The company requested an adjournment to a later date. The board denied the request on the grounds that the hearing was already pushed back once, and adequate notice and time were given of the new date. “[Westgate]’s failure to take advantage of that opportunity was not sufficient reason to further delay the hearing,” the decision reads. The primary grounds of the city’s arguments revolve around the safety of the site. Witnesses called by the city say the site has deteriorated since the August appeal hearing, and that all permits for the development are currently expired. The city also alleges Westgate had made no efforts to continue work on the site or renew any of the needed permits in recent months. The city argued that the only appropriate order was to back-fill the excavation, requesting Westgate be given two weeks following the decision. In the reasons for the decision, the appeal board agreed with the city’s stance that back-filling was the only realistic option. The board ultimately decided Westgate Properties must fill the hole by March 30, giving them more time to do so than the two weeks the city was asking for. Additionally, should Westgate fail to do so, the city will be allowed to take over backfilling in order to restore the site to its original state. 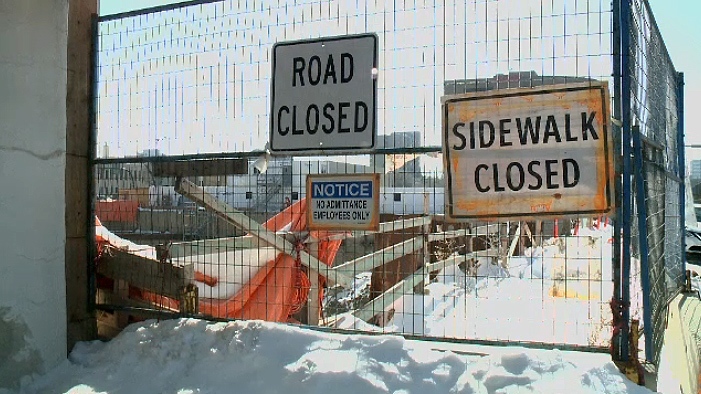 "Should Westgate Properties not comply within the timeline set by the board, the city is prepared to move forward with filling the hole," the city said in a written statement to CTV News. "We understand public frustration given the prominent location of the site, and ask for your patience as the city continues to work within its legal authority." The Capital Pointe construction site.